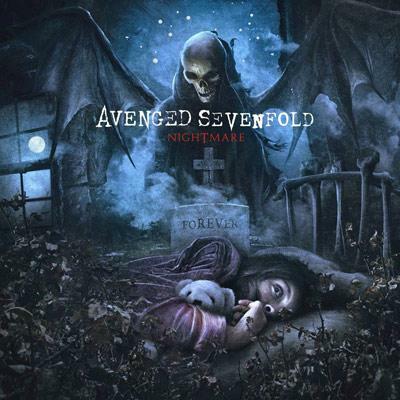 Avenged Sevenfold – Nightmare – Epic? On the 30th of July, I went to the shops to hunt down the new Avenged Sevenfold album. Sanity didn’t have it, but thank goodness for JB HiFi, the stand right at the front of the store that holds new release albums had a whole stack of Nightmare. Then over the course of the day, driving to and between jobs, I listened to the album. Here is my review from the first note of Nightmare, to the final note of Save Me. NB: I don’t do reviews, this is more a personal commentary on the album. Nightmare: This song is the single that the band released earlier in the year. I must say it took me a few listens to get into it. In fact the first time I listened to it I thought it was far too complicated a song, too much packed into it. But then I really listened to it and I appreciate it now for the different parts. The concept of the lyrics are dark and the music itself takes the listener on a journey. Welcome To The Family: All I have to say about this song is that it’s catchy as hell. Again, another one I had to ease into. The track is pop influenced, but is NOT a pop song unless you count the fact that it could fit easily on a popular listing along with something far more pop-based, for example Simple Plan’s Shut Up [but even that is a very weak thing to say.]. The whispering adds an extra dimension and elevates the track. Dangerline: As with the first two tracks, I had to ease myself into this one. Several listens though served to give me time to pick up the nuances within the vocals particularly. This track is proof that M Shadows can do anything with his voice. It can tell a tale, carry emotions and I admire the band for writing something for the troops [even though their focus was the US troops, it fits for troops from all countries all over the world]. Buried Alive: I’ll start with one major point. THIS song is my favourite on the album. And one line stands out for me: ‘Meanwhile the mice endure the wheel.’ As M Shadows has stated in interviews the song has two choruses and moves seamlessly between the two parts. This was one song that I liked as soon as I first heard it. The breakdown between the first part of the song and last part is almost like a wakeup call. Natural Born Killer: This is a fast, hard crazy song. The beat is reminiscent of a rapidly beating heart. The lyrics are heartfelt as it has been for the last few tracks. Not a favourite for me. So Far Away: M Shadows is a great vocalist. He has the ability to sing clearly and convey a sense of emotion. This track was written by Synyster Gates as a tribute to the band’s fallen friend and drummer, The Rev. God Hates Us: An angry song filled with M Shadows brutal vocals. Screaming in a guttural, visceral manner you can feel the pain and anger bleeding out. Again a track that took me awhile to appreciate. I was honestly scared to even listen to the track, not being a fan of screaming vocals at the best of times, I was ready to cringe. But when I got to listen to it for the first time, I really understood how well it suited the emotions. The beat itself is one which you could imagine bobbing your head to. Crank this one up on your car stereo, wind down the windows. And if you’re angry at the world, lost someone close to you in an untimely fashion…then this is an anthem for you. Victim: M Shadows voice, gospel voice and church bells? A beautiful melody threading throughout? And heartfelt, heartwrenching lyrics? This track is everything and more. Everyone can relate to the words he sings: “We’re all just victim of a crime.” Harking back to the passing of their friend…it gives deeper meaning. Tonight The World Dies: This song honestly gave me a vibe similar to that of a track written by The Eagles. And that band to me is a collection of some of the most amazing singer/songwriters around. [They also have a drummer who can sing…just like The Rev could drum and sing…]. A track about loss, and listened with the passing of The Rev in mind…gut wrenching. Fiction: Haunting. Written in a minor key the song is almost one of mourning. The mix of M Shadows and The Rev’s vocals is surreal. I had a vision of Shads standing in darkness with The Rev’s voices washing over him from above. The first time I heard it, it broke something in me and tears started to stream down my face. But after several more listens I noticed that there is a key change, just a slight one from minor to major. Giving almost a sense of hope for better things. Save Me: First off, I found this a difficult track to get into. It is a long one with many different parts. I have only listened to it once all the way through. However, what M Shadows said in an interview is very true, it is cinematic. One could use it to tell a tale. It’s a journey. The whole album IS epic. It has some technical flaws, yet one can overlook those. It takes one through an emotional rollercoaster, it tells a tale and it is a wonderful tribute to The Rev. May he Rock In Peace. Okay, so this is a band I’m obsessing over at the moment. I have to honestly say they are my favourite band since first hearing them at the end of October. I did hear one song back in 2006, but at that stage I wasn’t into that sort of music. This is the second pre-released song before their 5th album comes out on the 27th of July. [30th for us here in Australia]. The song is called Buried Alive and I can’t really explain it except it makes me realise again how true a vocalist the lead singer is. An amazing band. The album is Nightmare. The first single was Nightmare. The album is a mix of concept ideas loved by The Rev and songs that are about and for the drummer. May he Rock In Peace. PS. Yes I know some people might be thinking, why are you listening to music like that, you’re such a clean cut person and you’re a Christian. But honestly, I appreciate music as an art form and a way of expressing emotions. But I do not prescribe to the artists’ own personal beliefs, whatever they may be; that’s not what the music is about to me. I think I have Monday-itis. But then again I have everyday-itis. If that even exists. Tuesday nights are alright, though. I have worship rehearsal at Church. But I have weekday-itis, otherwise. This week is going to be busy. Have to organise everything for two PD’s one on Thursday, one on Friday. I also have to go into Centrelink on Wednesday; need to go to my friend’s and water her plants as well. I haven’t found ten jobs this fortnight, and I have to take my job seeking diary in to Centrelink. I hope they’ll accept it, especially since I’m waiting to hear from the Childcare on whether I will get the position or not. I hope and pray that I do. Not that there’s anything wrong with where I work now, I would still work there. The childcare is after school hours for two hours. So, we’ll see. In other news, I am excited for the release of A7X’s album. I cannot wait. 18 days! Oh, and Simple Plan are going into the studio tomorrow, I believe. First single by Christmas, hopefully. Maybe earlier? I hope. Yes, music is a big part of my life. I might point out that I think that listening to all sorts of music does no one any harm, and that music that some people think Christians shouldn’t listen to isn’t really that bad at all. Music is a form of art, people can appreciate it without subscribing to supposed beliefs the music puts out. So, yes, I have no problem with listening to music such as metal where they cuss a bit. Another note, sport. When I say I think soccer is not a real sport, I think I am allowed to have my opinion and not have someone else tell me my opinion doesn’t count. Thanks, it’s a free country and my opinion counts as much as the next person. I think soccer is boring to watch. Nothing wrong with that. Also, cricket and AFL are real sports! we know how to play the game. to uphold The Magpies name. For the good old Collingwood! ‘Is there anything breakable in here?’ asked the postal clerk. ‘Only the Ten Commandments.’ answered the lady. A hand shot up in the air. ‘He is an artist!’ said the kindergarten boy. Really? How do you know?’ the teacher asked. The minister was preoccupied with thoughts of how he was going to ask the congregation to come up with more money than they were expecting for repairs to the church building. Therefore, he was annoyed to find that the regular organist was sick and a substitute had been brought in at the last minute. The substitute wanted to know what to play. During the service, the minister paused and said, ‘Brothers and Sisters, we are in great difficulty; the roof repairs cost twice as much as we expected and we need $4,000 more. Any of you who can pledge $100 or more, please stand up’. The Spirit of the Sovereign LORD is on me, because the LORD has anointed me to preach good news to the poor. He has sent me to bind up the brokenhearted, to proclaim freedom for the captives and release from darkness for the prisoners, to proclaim the year of the LORD’s favor and the day of vengeance of our God, to comfort all who mourn, and provide for those who grieve in Zion — to bestow on them a crown of beauty instead of ashes, the oil of gladness instead of mourning, and a garment of praise instead of a spirit of despair. They will be called oaks of righteousness, a planting of the LORD for the display of his splendor. So, I went to the Kids Inn childcare this morning, and can you say ‘Awesome’? The staff are great, they seem to love their work there. And the kids, were just sweet. I am hoping so much that I get a position here. I will probably be doing after school hours care, which fits in well with me staying on at STAWA. I guess I will have to let CentreLink know though. I’ll have to find out exactly what I need to do to let them know of my change in circumstance. Anyway, maybe this might be my forte? Working in childcare? We’ll see.